Dripping with 10,000 solid gold sequins that mimic “the liquid and sensuous quality of how ice cream melts,” fashion designer Zac Posen’s fabulous couture gown commemorates the U.S. debut of the Magnum Gold?! ice cream bar. The dazzling dress is valued at $1.5 million and, yes, the ice cream has unusual punctuation in its name. While the new Magnum Gold?! bar is made of vanilla bean ice cream with a swirl of sea-salt caramel and a gold-colored Belgian chocolate shell, the Posen gown is made from tiny paillettes hand cut from genuine 24-karat gold sheets. It took Posen’s design team two weeks to hand-embroider the sequins into place. The Magnum brand already generates more than $1 billion in sales in 45 countries, and the company’s parent, Unilever, decided to go all-in when it came to the U.S. introduction of the Magnum Gold?! line. 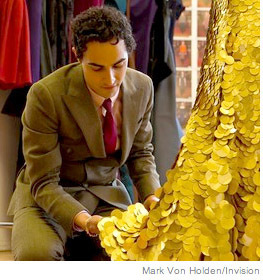 The "Project Runway" judge told an online publication: "Creating my first-ever 24-karat gold dress was a truly priceless experience. I'm naturally drawn to luxury and love to push my creativity, so the design process of creating a couture dress made of gold was thrilling." "I pulled inspiration from Magnum Gold?! for the dress design," he said. "The train reminds me of melting ice cream. The dress is so decadent." Brazilian model and actress Caroline Correa will be first wear the $1.5 million gown when she walks down a specially prepared gold-colored carpet at the Tribeca Film Festival on April 18. 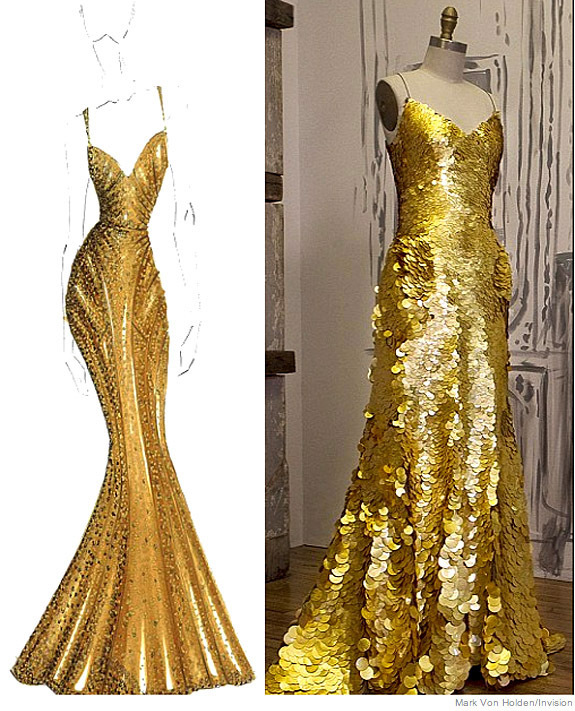 During the festival, the dress will make an appearance in a short film called As Good as Gold, starring Correa and Magic Mike actor Joe Manganiello. Manganiello plays a gold thief who falls for the beautiful, but dangerous, Correa as she wears Posen's gilded dress. In the film, he finds out the hard way that all bets are off when it comes to women who pursue "pleasures that are as good as gold." 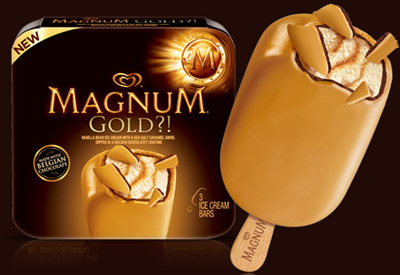 The first TV commercial for the Magnum Gold?! bars is set to air nationally during the MTV Movie Awards on April 14. Since Royal Fine Jewelers is a family business, owner Sandee Schulwolf and her staff are committed to Louisville and their customers. According to Sandee, "Reputation follows you and that's why we have been in business since 1947. Every customer who walks through our door is very important to us, whether they buy a $20,000.00 ring or a $10 watch band." Jewelry should not be a commodity, but a beautiful piece of art that makes the wearer feel special. We want your purchase at Royal Fine Jewelers to be a pleasant experience with attentive and knowledgeable salespeople. We strive to have fine quality jewelry, good values and many one of a kind pieces. If you want that special piece of jewelry come visit us at Royal Fine Jewelers. Please enjoy our daily blog postings. We will be scanning the Internet for unusual, entertaining and informative items related to fine jewelry and gemstones. Visit RoyalFineJewelers.com for a wide selection of fine jewelry and loose diamonds.